Stock is expected to come in by the end of July, orders will be shipped out in a first come first serve basis. 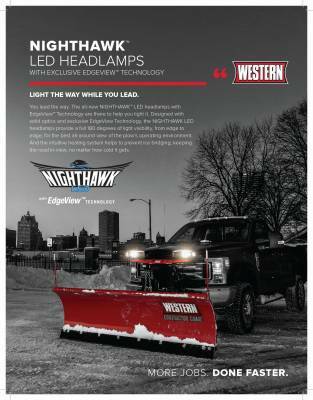 This part is used to upgrade your current Western plow lights to the NEW LED light set. This kit is an upgrade kit, which contains the head lamps, a headlamp conditioning module, and a new 16 pin harness. These new headlights have a new heating system that senses the temperature on the lens and automatically turns on the heating system, ensuring that they don't get covered in snow while plowing. New EDGEVIEW technology features a dedicated lens that directs an LED light on the outer edges of each headlamp, providing you with a full 180 degrees of light visibility, illuminating the plow from edge to edge. These lights feature an ultra-bright,ultra-wide LED light that provides up to 2x the light output of halogen bulbs for maximum visibility. With the high beams on, the light will bright up the length of 3.5 football fields, or 350 yards.